DON’T LEAVE MILLIONS of dollars on the table because you don’t fully understand the process of marketing and selling a business. There are many common denominators leading to Maximum Value regardless of the type of business you may be selling. They apply across the board whether your business is in aerospace, biotechnology, distribution, engineering, Internet/e-commerce, manufacturing, or retail sales. Maximizing value begins at the moment you’re ready to put your life’s work on the market. At the close of the day, the right price is a “fair price” for you and the buyer. The essential point is to insure that you get your fair price, which if handled correctly, can be a higher price. Multinational Company A made an offer to buy a particular business for $35 million. Multinational Company B looked at the same business and offered $60 million. Why the disparity? Each prospective buyer had a different “perception of value.” Disparity in perceived value, although not typically this large, occurs everyday in the marketplace. Another business received an offer for $11 million. That was followed by two comparable offers from other prospective buyers. At the close, after the bidding stopped, the company sold for $16 million. There may be considerable swings in the value meter during the time a business is on the “For Sale” block. Note that these swings are likely to happen during the sale of your business as well. A brief overview of how businesses are valued will begin the process of helping you understand how to increase perceived value in your buyer’s eyes. The bottom line is that all buyers have to economically justify the purchase price. The buyer arrives at that price by becoming confident in his or her mind that after the acquisition the business will generate sufficient cash flow to provide a reasonable rate of return on the investment. For example, if a buyer requires a 20%pretax return on investment, that buyer would be willing to pay 5 times the annual cash flow of the business (100/20 = 5). A business that generates $2 million per year in cash flow would be valued by that buyer at $10 million ($2 million x 5). The key number, 5, that is used as a multiplying factor of cash flow, is called the Valuation Multiplier. Depending on the nature of your particular business and the current mindset of the buyer, the Valuation Multiplier can range from 1 (small service company) to infinity (Internet companies with no earnings). After eliminating extremes on both ends, the range of multipliers “generally” sways between 4 and 10. But don’t immediately apply this to your business. A “strategic” buyer will generally pay more because a merger within the same industry saves money and adds synergy through consolidation. Larger companies have more resources and may be willing to pay a higher purchase price if there will be a positive effect on their price/earnings ratio. “Financial” buyers – or investors looking primarily at the rate of return on investment – and smaller purchasers generally will pay less for a business. Additional insight regarding business valuations can be obtained by reading the Valuation Brochure. Choosing the right business broker is one of the most important decisions you will make in maximizing the value of your business. Assist with a preliminary valuation of your business. Help prepare the Selling Memorandum. Bring qualified buyers to the table. Working with companies of a similar size. Familiarity with your industry and its key players. A good blend of financial and marketing expertise. Extensive experience in marketing and selling companies. Resources to conduct in-depth market/industry analysis. Extensive database of prospective buyers, including but not limited to investment funds and other institutions. Engaging personality and superior negotiating skills. Your business broker must have high marks in each of these seven categories. A deficiency in any of them will translate into less dollars for your business. It took a lot of ingenuity, hard work, and perseverance to build your business. Now that you have arrived at the point in time that you are ready to sell, you need to be properly rewarded for your efforts. Unfortunately, some business owners believe that prospective buyers should automatically appreciate how difficult it was to build the business and how valuable the business really is. This misperception usually leads to one of two results: (1) the Selling Memorandum is too brief; or (2) the Selling Memorandum is lengthy, but contains mostly “fluff” and very little in the way of supporting facts. When selling a product or service, you probably presented detailed information on how it works, its competitive advantages, etc. Those same marketing techniques must be applied to the sale of your business. The phrase, You only have one chance to make a good first impression should be paramount in your mind when preparing the Selling Memorandum. Maximum Preparation (MP) will result in Maximum Value (MV). Repeat this mantra often, “MP = MV,” to achieve your goal. Preparing the actual Selling Memorandum is often a source of frustration for sellers. Unrealistic expectations can cloud your clarity. It is not a document that can be prepared all the way through by your business broker. It is incumbent upon you, the seller, to provide significant input for the Selling Memorandum. The goal is to have a Selling Memorandum that virtually transports a potential buyer into accepting your Maximum Value. No one can convey the true essence and value of your business better than you can. While the business broker can give you the framework for the Selling Memorandum, provide in-depth market and industry research, and edit and produce a sharp final product, your keen insight into the potential of your business has to bleed through this key document. You selected the ideal business broker and wrote the world’s best Selling Memorandum. Now it’s show time! You will receive the greatest value for your business by having the largest number of qualified buyers bidding on your treasured enterprise. The term “qualified” is so important because you can’t waste valuable time negotiating with individual buyers – or buyer teams – who do not have the resources or the proper motives to close the deal. You and your business broker should agree on the marketing approach. If your Selling Memorandum is highly confidential, as it is in many cases, you should pre-approve all recipients of the document. You should not, however, restrict your broker’s style of working. Placing too many restrictions upon which potential buyers can be contacted severely limits outside interest. One common seller’s mistake is not allowing the broker to market the business to competitors. This can be a deal-breaker since many privately held businesses are sold to competitors. While prudent precautions should be implemented when providing information to competitors, they generally should be included in the marketing process. A direct-mail campaign to stimulate interest usually precedes the distribution of the Selling Memorandum. Your business broker then sends the document only to “qualified” buyers who respond to the mailing. Prompt phone follow-up is critical. You never ever want to lose any potential buyers at the front end of the marketing process. Your business broker will not only insure that the appropriate parties receive Selling Memorandums, but also will engage in preliminary negotiations with prospective buyers to ascertain which are the best candidates to buy your business. Expect this process – preparing the Selling Memorandum, marketing the company, identifying the most likely buyers, and completing the transaction – to take from 3 to 12 months. Selecting the right business broker is essential. But reaching your Maximum Value can only be obtained if other supporting players on the Selling Team are in place. It is important to establish lines of communication with each of these four players when you begin the marketing process, and certainly before a Letter of Intent is signed. Each of these advisors can not only give specific professional advice, but can also provide valuable business insight into the selling process and final negotiations. Please read the Team Brochure for additional information on fielding your Selling Team. 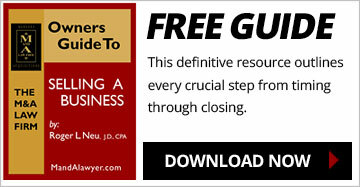 Your M&A attorney will be a key player from start to finish in the acquisition process. An experienced M&A attorney can help spot and avoid potential pitfalls as well as guide you safely through the selling process. The M&A attorney provides this guidance, in part, by helping you quickly and easily understand and resolve issues and obstacles that may come up during the course of the transaction. A sharp M&A attorney is a seasoned specialist who searches out solutions that not only maximize value, but also assure you of the successful completion of the transaction. Most importantly, a skilled M&A attorney can simultaneously deal quickly and efficiently with minor issues while keeping everyone focused on resolving major issues. “Majoring in the minors” will usually drive everyone insane and more often results in reducing, instead of maximizing, value. Worse; that kind of preoccupation can kill the deal! Your M&A attorney should be involved at the very beginning of the selling process. He or she should definitely review the Selling Memorandum before it is mailed, as well as be involved in the preliminary negotiations before signing the Letter of Intent. The drafting of the final, bulletproof Letter of Intent should be the collective expertise of all five of your advisors. It’s now or never. It’s the bottom of the ninth and you’ve got to drive in the winning run. The negotiations leading up to the Letter of Intent (LOI) and the terms and conditions set forth in the LOI are the most critical stages in achieving Maximum Value. The LOI should address the price and all the other major terms. Although not all of the terms are contained in your LOI, as a seller, you should not assume that the excluded terms can be used as leverage points to increase the purchase price or to change other key terms during negotiations and preparation of the final agreements. Sellers and business brokers who do not take the LOI seriously up front can later find themselves struggling to get to the deal they wanted at the outset. Even though an LOI may be non-binding, there is a good-faith obligation on both parties to consummate the transaction as set forth in the LOI. Buyers do not look kindly on sellers who try to tweak the LOI. The buyer may terminate the deal or may become confrontational and suspicious because the seller is no longer trusted. The LOI should address major terms only. The parties must avoid protracted negotiations over minor issues. These will be addressed in the preparation of the final agreements. Remember that price is only one element. Other factors to weigh include payment terms, security, employment/consulting agreements, lease terms, post-closing liability limits, non-competitive clauses, purchase price allocation, and allocation of deal costs. The terms of sale can be effectively negotiated only if the discussions are undertaken with a thorough understanding of the business, legal, tax, securities, and other issues that impact the transaction. Please refer to the Letter of Intent Brochure at for a detailed explanation of the LOI. The seller’s involvement and my involvement in negotiations varies from deal to deal. In some transactions, I have negotiated the entire deal, while other deals have been brought to me after clients have negotiated most of the major terms (performing their own brain surgery). But Beware: Performing your own brain surgery can be dangerous to your health. Having an experienced business broker and M&A attorney at your side, thoroughly immersing themselves in the transaction, is essential to maximizing your sales price and should always be to your advantage. Negotiating skills are much more intricate than simply putting on a good show. The parties sitting across from you didn’t arrive there by being slouches. They are probably skilled negotiators so just “putting on the Ritz” won’t accomplish much. Instead, expert negotiators operate from a point of reference knowing what is the best resolution of each issue. This intuitive skill comes from prior M&A experience and being armed with the facts and legal expertise to support each proposal and each resolution. For example, if a buyer’s position is to make each selling shareholder “jointly and severally” liable for any post-closing liabilities, the attorney needs to know the customary resolution of this issue; i.e., who generally is liable and for what amount, and be able to persuasively present the case for limited liability. This is just one of many imbedded issues that requires prior legal experience and knowledge to help assure you get the best result. This same frame of reference lets the M&A attorney and the business broker know when to press-to-yes, when to say no, when to gently back off issues, and which issues are salient to maximizing value and successfully completing the transaction. 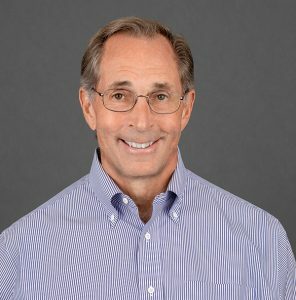 Negotiators should have an acute understanding of timing and protocol: when and how quickly to respond, whether to respond verbally or in writing, when to meet or have phone conferences, when to address key terms or negotiating points, and how to time communications and responses to heighten the interest of as many buyers as possible. Other negotiating skills include knowing whom to meet, what information to provide each level of buyer’s management, how to present information clearly and concisely; how to gain the trust of the buyer, and how to read and decipher negotiating techniques. Additional subtle details in the negotiating process – where to meet, where to sit during a meeting, and knowing how to read body language – can all make a difference in this high-stakes game. Let me illustrate. This example is based on an actual negotiating session in which I was representing the buyer. Eight people sat around the table. There were four on our side and four on the seller’s side. After hours of negotiation, my client, the buyer, offered an increased purchase price that was still $500,000 less than what he was prepared to pay. A brief pause and some subtle but noticeable body language by the seller and the seller’s advisors indicated to me, ever-so- briefly, that they agreed to our offer. After this brief pause, the seller raised some additional objections to the offer. Immediately, I requested a brief adjournment. Away from the table, I explained to my clients that the brief pause, body language, and other factors suggested that we had met, or were extremely close to meeting, the seller’s expectations. At that moment, I recommended that the buyer stand firm (even though they were willing to up the ante another $500,000) and should actually ask for some concessions. When we reconvened, it became readily apparent that my assessment was correct. Following some additional, but unsuccessful, maneuvering by the seller for a higher price and further negotiations, both the buyer and the seller left satisfied with the deal. Not only did my client save $500,000 in the purchase price, but he also benefited from additional seller con-cessions worth several hundred thousand dollars. Bottom Line: The seller lost almost $1 million because of the manner in which he and his advisors handled the negotiations. Don’t let this happen to you. You, the seller, should meet with your business broker and M&A attorney before meeting with buyers or going into these types of negotiating sessions. It is important that each party clearly understands its role and you know what to expect. Sellers should also insist that their advisors be well armed with the necessary facts before entering negotiations. The essence of negotiating is understanding and meeting the needs and desires of the buyer. The value of your business increases with each additional benefit you bring to the buyer. Remember the mantra MP = MV (Maximum Preparation = Maximum Value). to fully appreciate the value of your business. Before the negotiations begin, you and your advisors should learn as much information as possible about the prospective buyer or buyers. That information can then be used to present a convincing game plan to show how the buyer will benefit conceptually and financially by acquiring your business. Additionally, nurturing good relationships between buyer and seller and their respective advisors can enhance each element of the negotiations. Discussions based on respect and integrity are not only more productive, but also more enjoy-able. Good relations will benefit you during the transaction and will pay additional dividends as you work with the buyer following the sale. There are also several “nuance”-type factors that must be thoroughly weighed as you step back and examine the big picture of selling your business. Here are eight key points to help enhance the value of your business. 1. If possible, have audited financial statements available. Most business brokers concur that audited statements will help increase your purchase price. If an audit is not possible, be certain your financial information is accurately maintained and presented in a professional manner. Security – Assurance that deferred payments will be made is essential. If the buyer is a newly formed subsidiary, then the seller should go to the parent company for guarantees and security. In some cases, highly leveraged transactions do not provide any security for deferred payments. If this occurs, the seller needs to step back and carefully weigh this potential red herring to evaluate the real value of the offer. Stock Payments – Seller beware! If the buyer’s stock is accepted as payment, it is usually done as a “tax-free transaction.” If you sell the stock soon after the sale, or if the transaction fails to meet the requirements of a “tax-free transaction,” your tax benefits disappear. The defining question is this: Do you want to risk your entire life’s work (sales proceeds) on a business (the buyer’s business) that you probably have little knowledge of and do not control? Receipt of stock of an established company that is readily traded may have some merit. But, as a rule, sellers and sellers’ advisors need to carefully analyze any stock proposal. In a stock transaction, the selling price will usually be higher because of the speculative value of the stock received versus the fixed value of a cash payment or adequately secured note. Contingent Payments and Performance Payments – Many sellers who have structured their sale with performance payments have second thoughts and generally advise against it. Contingent payments and performance payments are different sides of the same coin: each requires making a portion of the purchase payment contingent upon future performance. Sometimes that performance is dependent on numbers that the seller guarantees to justify the selling price. Sometimes it consists of revenue and/or profit targets that will provide payments to the seller above and beyond the original purchase price. Could your business merge immediately or perhaps later with the buyer’s business? Could product lines be discontinued, altered, or changed? Could the buyer’s method of accounting for overhead and other expenses differ significantly from yours? Contingent or performance payments should not automatically be excluded, but you must investigate them with great caution. Future Participation in Buyer’s Business – Sellers should not focus strictly on the value of their “business” while overlooking their “individual” value. Added value may be reaped from finding ways the seller can participate in the buyer’s business. The seller can negotiate significant financial incentives – on top of the purchase price – to expand or otherwise contribute to the buyer’s business after the sale. This is a lucrative opportunity that is often not explored. 3. Listen to the market and execute precise timing. Sometimes sellers miss their best deal because it is not the deal they want, only to settle later for a lower offer. If knowledgeable buyers have evaluated your business and negotiations have resulted in final offers, it’s likely these offers reflect the true value of your business. If these potential buyers are not considered seriously, you may face a protracted marketing process that only attracts lower offers later. Or it may be best not to sell, and instead continue operating the business until market conditions turn more favorable. Even if market conditions do not brighten, you will have gained the profit generated during the additional time you own your business. If you hold pat, however, you continue to run the inherent risk of operating a business in addition to gambling on maintaining or increasing its value when you re-enter the market at a future date. Unacceptable offers may indicate bad timing. As in most selling, timing plays a significant role in obtaining Maximum Value. Before going to market, consider the general economic trends. Then consider your industry and related industry trends to flesh out any potential buyers. Also, examine closely the most probable buyers and see if they are actively engaged in acquisitions. 4. Provide solutions for the buyer. With an objective eye, search for any negatives or problems in your business and be prepared to provide solutions for the buyer. Be sure to maintain balance in what you disclose to the buyer and when you disclose it. As a rule, be candid with the buyer. But if you present negatives, immediately have a ready supply of two or more solutions or positives. Do not let the buyer leverage those negatives to beat you down until the purchase price is driven into the ground. Remember the formula MP = MV and be ready to launch from all sides with your solutions, emphasizing a positive and profitable long-term strategy. 5. Avoid post-closing liability. The sale is completed. The champagne is popping. You’ve taken a big fat check to the bank (or it arrived there by wire transfer). Maximizing value means not giving back any portion of that check to the buyer. To insure that won’t happen, make sure all of the transaction documents are properly prepared and completed. Attached to the primary purchase agreement will be disclosure schedules and/or numerous exhibits. These allow the seller the chance to make disclosures and “representations and warranties” relating to the business. The representations and warranties, will address 25 to 35 different areas of the business. Post-closing liability usually stems from improperly drafted representations and warranties and from the seller’s failure to properly reveal items in the disclosure schedules. The manner in which each of the representations and warranties is made must be carefully addressed, as there are numerous legal and business issues to consider. The structure of the representations and warranties will then dictate the nature and extent of the disclosures required. Even though the buyer may be fully aware of any misrepresentation(s) or item(s) not disclosed, you as the seller can still be liable for misrepresentations and failure to make proper disclosures. Buyer’s due diligence does not relieve or reduce the seller’s responsibility or liability. Please refer to the Buying A Business brochure for details on this most critical process. Sellers should always negotiate for a “deductible” to offset future buyer claims. With a deductible, the buyer cannot make claims against the seller until the aggregate of those claims exceeds a specified deductible amount. When the claims do exceed that amount, the buyer should only be able to recover the amount in excess of the deductible. Sellers should be on high alert that buyers will almost always want to change the “deductible” concept and seek compensation for 100% of their losses if the buyer’s claims exceed the deductible. For example, if total claims are $300,000 and the deductible is $250,000, the seller will want a provision that allows the buyer to only recover $50,000. Of course the buyer will want a clause that seeks the entire $300,000, since the amount of the deductible was exceeded. (Buyers often use the term “basket” for this approach.) General rules of thumb govern the amount set as a deductible and whether or not the “deductible” or “basket” approach will prevail. Establishing and maintaining a smooth working and mutually respectful relationship with the buyer is the best way to avoid post-closing liability. It is simply amazing how many difficult issues can be fairly and readily resolved if the parties have established a trusting relationship from the outset. And if the seller continues as an employee or consultant of the buyer, the ongoing opportunity to work together can ensure that minor issues do not become major hand grenades. 6. Unity of sellers. When the seller has numerous shareholders or owners, it is important that everyone lock arms. Even though each owner’s goals may vary to some degree, the buyer must not be allowed to manipulate that to his advantage while negotiating the purchase price. Owners should have one “point person” who communicates on their behalf. Each of the owners, however, has the right to participate in seller discussions with counsel, to receive full and complete information regarding the transaction, and seek their own legal counsel. 7. Protect your business during the selling process. Selling your business becomes a second career. For most sellers that means finding more time in their current 60-hour week. The sales process can become a major distraction from running and promoting your business. When this happens the business can suffer. That can directly impact your value during the 3- to 12-month selling period needed to complete the trans-action. If the transaction unravels at the end, you may have sacrificed not only part of your current value, but also up to a year’s growth of your business. As difficult and time-consuming as it will be, stay focused on what brought you to the dance floor. DO NOT let your business slide by the wayside. The buyer needs the perception and the reality that your business is heading north, not south. This much-needed upward momentum will make it easier for the seller to prevail on many of the transaction issues right up to that joyous date of closing. 8. Gain more value by staying on the train. Often, a seller will retain an equity position in the buyer following the sale. This occurs frequently with “financial” buyers who need current management to continue to grow the business. That same management team may also be positioned prominently to attract other synergistic companies. Even though your retained equity interest may only be 10% to 30% of the sales value, that ongoing interest could produce additional value that exceeds the initial sales price. For example, a seller sells his business for $20 million and retains a 20% equity in the future growth of the buyer. If the new owner is on an aggressive acquisition and growth path that leads to a much larger company with increased value of $100 million, the seller will receive another $20 million at the time the buyer elects to sell. In some cases, the seller’s retained interest may generate added value through an IPO by the buyer and registration of seller’s interest. Maximizing your value may mean more than just receiving the highest purchase price. A very significant human or emotional element exists in most transactions that should be addressed. Value may be determined, in part, by how well the seller fits into the company culture of the new owner. You must determine if working with the buyer will be a rewarding and satisfying experience, or one of constant stress and frustration. Ask yourself these questions up front in the negotiations to make sure you’re making the correct decision. Frequently sellers want to protect their employees. This can be a highly charged issue. Therefore, the seller’s desires in this area should be direct and clear early in the negotiations. Both of these cultural and employee issues can be evaluated in economic terms. You may want to seek a higher selling price as compensation for a buyer work environment that you believe will be more strenuous. You may also want to deal for a higher purchase price and pass on the increase to loyal employees who you know are going to be terminated. Finally, have you emotionally disconnected from not having day-to-day control of your enterprise? And are you ready to move on with the rest of your life? The answers to these questions affect sellers at staggered times and with varying impacts. Sometimes the seller experiences a great sense of relief and satisfaction. Other times, the entrepreneurial spirit lives on and the seller struggles with letting go. Like many major decisions, your feelings will run the gamut from “Get me out of here as soon as possible!” to simply “Why am I selling?” It is so crucial to determine at the outset whether you are fully committed to selling your company. But once you have made the decision to sell, seek the very best professional guidance you can find. You will learn that excellent advisors can walk you smoothly through the process. That guidance will help you get Maximum Value and successfully launch you.